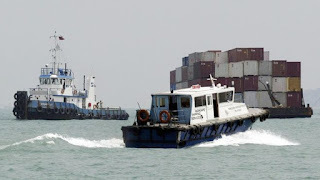 The United Nations has banned four ships from visiting any global port, after they were found violating sanctions imposed on North Korea. Hugh Griffiths, co-ordinator of a UN panel on North Korean sanctions, described the move as unprecedented. The ships were reportedly the Petrel 8, Hao Fan 6, Tong San 2 and Jie Shun. The UN Security Council expanded sanctions on North Korea last month in response to Pyongyang's sixth and largest nuclear test yet. The ban was announced following a UN meeting on Monday. Mr Griffiths, speaking after the meeting on the enforcement of sanctions on North Korea, said the ships were found "transporting prohibited goods". He said the ban, which went into effect on 5 October, did not entail asset freezes or travel bans. According to the MarineTraffic website, a maritime database that monitors the movement of vessels, Petrel 8 is registered in Comoros, Hao Fan 6 in Saint Kitts and Nevis, and Tong San 2 in North Korea. The registered country of Jie Shun is not listed.